Seven Heaven Banquet, Lawrence Road Industrial Area, Delhi is a gorgeous wedding venue in the city. It is located at a close distance from Punjabi Bagh Metro Station and Office of The District Magistrate which makes it easily accessible for all. It has multiple banquet halls that you can check out for various functions. Seven Heaven Banquet Hall is available in different time slots, you can select the one that matches your requirements. It also offers a complimentary changing room for the bride and the groom on their special day. Seven Heaven Banquet serves a wide range of flavoursome delicacies to choose from in both vegetarian and non-vegetarian food to their guests. The decor team takes care of the decoration for your big day. Seven Heaven Banquet Lawrence Road serves alcohol and also allows you to get it from outside to entice your guests. The venue offers ample car parking space and valet parking service to their guests for their convenience. The first floor can be used for small functions like birthdays, anniversaries and pre-wedding functions. While ground floor and basement are ideal for an intimate wedding. The second floor can be used to host a grand wedding and reception ceremony which can also accommodate a huge crowd for your function. So go ahead and plan your upcoming functions at Seven Heaven Banquet, Lawrence Road Industrial Area, Delhi. B-52, Lawrence Road Industrial Area, New Delhi-110035. 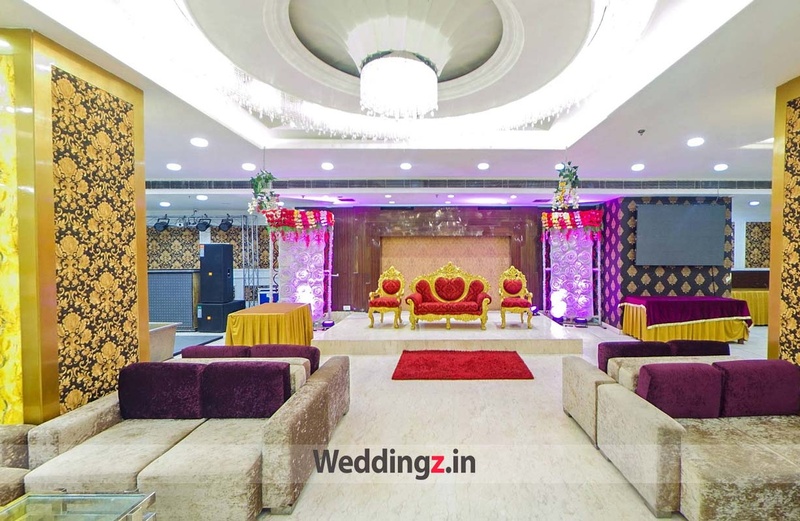 Basement and ground floor can be combined to have a lavish wedding and reception also it can accommodate a huge crowd for your function. The Seven Heaven Banquet located in Lawrence Road Industrial Area, Delhi has Banquet Halls. Ground Floor can accommodate upto 100 guests in seating and 150 guests in floating. First Floor can accommodate upto 100 guests in seating and 150 guests in floating. Second Floor can accommodate upto 350 guests in seating and 550 guests in floating. Basement can accommodate upto 150 guests in seating and 250 guests in floating. Vegetarian and Non Vegetarian food is served at this venue. Features of this wedding venues are : Food provided by the venue , Non-Veg allowed at the venue , Alcohol allowed at the venue , Outside alcohol allowed at the venue , Halls are air Conditioned , Ample parking , Baarat allowed , Fire crackers allowed , Hawan allowed , Overnight wedding allowed , Decor provided by the venue , Packages starts at Rs 850 per plate for vegetarian menu and at Rs 1000 for non veg menu. Decoration starts at Rs 31000.